Transcript: Vice President Biden's Convention Speech Transcript of Vice President Joe Biden's speech at the Democratic National Convention. Vice President Joe Biden addresses the Democratic National Convention in Charlotte, N.C., on Thursday. And my favorite Democrat, Jilly, I want you to know that Beau and Hunt and Ashley and I — we're so incredibly proud of you, kid. You know, we admire the way — they way that when every single solitary young person — and they're not all young — walk into your classroom, you not only teach them, you give them confidence. And I say to my fellow Americans: My fellow Americans, four years ago a battered nation turned away from the failed policies of the past and turned to a leader who they knew would lift our nation out of the crisis — a journey — a journey we haven't finished yet. We know we still have more to do. But today I say to my fellow citizens: In the face of the deepest economic crisis in our lifetime, this generation of Americans has proven itself as worthy as any generation before us. (Cheers, applause.) For we present that same grit, that same determination, that same courage that has always defined what it means to be an American, has always defined all of you. Together we're on a mission. We're on a mission to move this nation forward from doubt and downturn to promise and prosperity, a mission I guarantee you we will complete — (cheers, applause) — a mission we will complete. 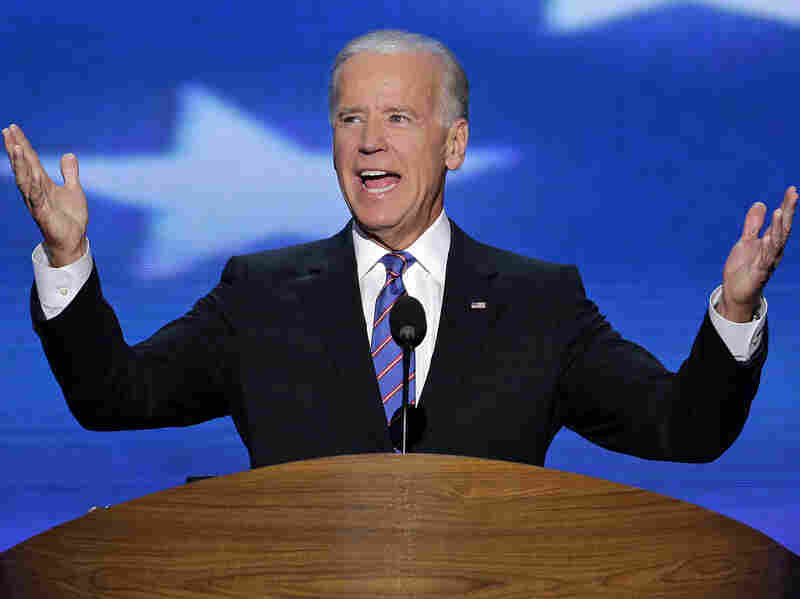 Vice President Joe Biden addresses the Democratic National Convention, from PBS NewsHour. Folks, tonight what I really want to do is tell you about my friend Barack Obama. (Cheers, applause.) No one could tell it as well or as eloquently as Michelle — as you did last night, Michelle — Monday night. (Cheers, applause.) But I know him, to state the obvious, from a different perspective. I know him, and I want to show you — I want to show you the character of a leader who had what it took when the American people literally stood on the brink of a new depression, a leader who has what it takes to lead us over the next four years to a future as great as our people. I want to take you inside the White House to see the president as I see him every day, because I don't see him in soundbites. I walk 30 paces down the hall into the Oval Office, and I see him, I watch him in action. Four years ago the middle class was already losing ground, and then the bottom fell out. The financial crisis hit like a sledgehammer on all the people I grew up with. You remember the headlines. You saw some of them in the previews. Highlight: Highest job losses in 60 years. Headlines: Economy on the brink; markets plummet worldwide. From the very moment President Obama sat behind the desk, resolute, in the Oval Office, he knew — he knew he had not only to restore the confidence of a nation, but he had to restore the confidence of the whole world. (Cheers, applause.) And he also knew — he also knew that one, one false move could bring a run on the banks or a credit collapse to put another several million people out of work. America and the world needed a strong president with a steady hand and with the judgment and vision to see us through. Day after day, night after night I sat beside him as he made one gutsy decision after the other to stop the slide and reverse it. I watched him. (Applause.) I watched him stand up. I watched him stand up to intense pressure and stare down enormous, enormous challenges, the consequences of which were awesome. But most of all, I got to see firsthand what drove this man: his profound concern for the average American. He knew — he knew that no matter how tough the decisions he had to make were in that Oval Office, he knew that families all over America sitting at their kitchen tables were literally making decisions for their family that were equally as consequential. And there's another thing, another thing that has bound us together these past four years. We had a pretty good idea what all those families, all you Americans in trouble were going through, in part because our own families had gone through similar struggles. Barack as a young man had to sit at the end of his mother's hospital bed and watch her fight with her insurance company at the very same time she was fighting for her life. When I was a young kid in third grade, I remember my dad coming up the stairs in my grandpop's house where we were living, sitting at the end of my bed, and saying, Joey, I'm going to have to leave for a while. Gone — go down to Wilmington, Delaware, with Uncle Franks. They're good jobs down there, honey. And in a little while — a little while, I'll be able to send for you and mom and Jimmy and Val, and everything's going to be fine. When Barack and I — when Barack and I were growing up, there was an implicit understanding in America that if you took responsibility, you'd get a fair shot at a better life. And the values — the values behind that bargain were the values that shaped both of us, and many, many of you. And today those same values are Barack's guiding star. Folks, I've watched him. He has never wavered. He never, never backs down. He always steps up, and he always asks in every one of those critical meetings the same fundamental question: How is this going to affect the average American? How is this going to affect people's lives? (Cheers, applause.) That's what's inside this man. That's what makes him tick. That's who he is. And tonight — tonight, although you've heard people talk about it, I want to talk about two things from a slightly different perspective, from my perspective. I'd like to focus on two crises and show you — show you the character of leadership that each man will bring to this job, because as I said, I've had a ringside seat. The first of these a lot's been talked about. But the first story I want to talk to you about is the rescue of the automobile industry. And let me tell you — let me tell you — from this man's ringside seat, let me tell you about how Barack Obama saved more than a million American jobs. In the first — in the first days, literally the first days that we took office, General Motors and Chrysler were literally on the verge of liquidation. If the president didn't act, if he didn't act immediately, there wouldn't be any industry left to save. So we sat hour after hour in the Oval Office. Michelle remembers how it must have — what he must have thought when she — he came back upstairs. We sat. We sat hour after hour. We listened to senators, congressmen, outside advisers, even some of our own adviser (sic), and we listened to them to say some of the following things. They said, well, we shouldn't step up. The risk — the risk was too high. The outcome was too uncertain. In those meetings — (cheers, applause) — in those meetings — in those meetings, I often thought about my dad. My dad was an automobile man. He would have been one of those guys all the way down the line, not on the factory floor, not along the supply chain, but one of those guys who were selling American cars to American people. I thought about — I thought about what this crisis would have meant for the mechanics and the secretaries and the salespeople who my dad managed for over 35 years. And I know for certain — I know for certain that my dad, were he here today, he'd be fighting like heck for the president, because the president fought to save the jobs of those people my dad cared so much about. (Applause.) Ladies and gentlemen, my dad — (applause) — my dad respected Barack Obama — would have respected Barack Obama, had he been around, for having had the guts to stand up for the automobile industry when so many others just were prepared to walk away. You know, when I look back — (applause) — when I look back now, when I look back on the president's decision, I think of another son of another automobile man, Mitt Romney. Mitt — no, no — Mitt Romney — Mitt Romney grew up in Detroit. My dad managed, his dad owned — well, his dad ran an entire automobile company, American Motors. Yes, what I don't understand is in spite of that, he was willing to let the — Detroit go bankrupt. VICE PRESIDENT BIDEN: No, don't. I don't think he's a bad guy. No, no. I don't think he's a bad guy. I'm sure he grew up loving cars as much as I did. But what I don't understand, what I don't think he understood, I don't think he understood that saving the automobile worker, saving the industry, what it meant to all of America, not just autoworkers. I think he saw it the Bain way. Now, I mean this sincerely. I think he saw it in terms of balance sheets and write-offs. Look, you heard my friend John Kerry. This president — this president has shown the same resolve, the same steady hand in his role as commander in chief. (Applause.) Look — which brings me to the next illustration I want to tell you about, the next crisis he had to face. In 2008 — 2008, before he was president — Barack Obama made a promise to the American people. He went on to say — he went on to say, that has to be our biggest national security priority. Look, Barack understood that the search for bin Laden was about a lot more than taking a monstrous leader off the battlefield. It was about so much more than that. It was about righting an unspeakable wrong. It was about — literally, it was about — it was about healing an unbearable wound, a nearly unbearable wound in America's heart. AUDIENCE MEMBERS: U-S-A! U-S-A! U-S-A! U-S-A! VICE PRESIDENT BIDEN: Most of all — most of all, President Obama had an unyielding faith in the capacity and the capability of our special forces, literally the finest warriors in the history of the world. (Cheers, applause.) The finest warriors in the history of the world. So we sat. (Cheers, applause.) We sat originally — only five of us — we sat in the Situation Room beginning in the fall of the year before. We listened, we talked, we heard, and he listened to the risks and reservations about the raid. He asked again the tough questions. He listened to the doubts that were expressed. AUDIENCE MEMBERS: (Chanting.) USA! USA! USA! USA! USA! USA! Look, four years ago — four years ago — the only thing missing at this convention this year is my mom. Four years ago my mom was still with us, sitting up in the stadium in Denver. I quoted her. (Cheers, applause.) I quoted her, one of her favorite expressions. She used to say to all her children — she said, Joey, bravery resides in every heart, and the time will come when it must be summoned. Ladies and gentlemen, I'm here to tell you what I think you already know. But I watch it up close. Bravery resides in the heart of Barack Obama, and time and time again I witnessed him summon it. (Applause.) This man has courage in his soul, compassion in his heart and a spine of steel. (Cheers, applause.) And — and because — because of all the actions he took, because of the calls he made, because of the determination of American workers and the unparalleled bravery of our special forces, we can now proudly say what you've heard me say the last six months: Osama bin Laden is dead, and General Motors is alive. (Cheers, applause.) That's right. One man. Speaking of tough decisions — speaking of tough calls — (chuckles) — last week we heard at the Republican convention — we heard our opponents — we heard them pledge that they too — they too heard the courage to make the tough calls. They — Mrs. Robinson, you — you watched from home, I guess, from the White House. You heard them talk so much about how they cared so much about Medicare, how much they wanted to preserve it. That's what they told you. Look, folks. That's not courage. That's not even truthful. That's not even truthful. In Tampa, they talk with great urgency about the nation's debt and the need to act, to act now. But not once, not one single time, did they tell you that they rejected every plan put forward by us, by the bipartisan Simpson-Bowles commission they referenced — (applause) — or by any other respected group to reduce the national debt. They are not for any of them. Why? Because they're not prepared to do anything about the debt if it contained even one dollar — I'm not exaggerating — even one dollar or one cent in new taxes for millionaires. Look — look. In a sense, this can be reduced to a single notion. The two men seeking to lead this country over the next four years, as I said at the outset, have fundamentally different visions and a completely different value set. And what I've found — what I found fascinating, the most fascinating thing I found last week was when Governor Romney said that as president, he would take a jobs tour. Well, with his support for outsourcing, it's going to have to be a foreign trip. (Cheers, applause.) It will. Look, President Obama knows that creating jobs in America, keeping jobs in America, bringing jobs back to America is what the president's job was all about. Look, I kind of expected all that from him. But one thing truly perplexed me at their convention. The thing that perplexed me most was this idea they kept talking about about the culture of dependency. They seem to think you create a culture of dependency when you provide a bright, young, qualified kid from a working-class family a loan to get to college or when you provide a job training program in a new industry for a dad who lost his job because it was outsourced. Folks, there's one more thing, one more thing our Republican opponents are just dead wrong about. America is not in decline. America is not in decline. (Applause.) I've got news for Governor Romney and Congressman Ryan: Gentlemen, never ever — it never makes sense, it's never been a good bet to bet against the American people. (Cheers, applause.) Never! My fellow Americans, America is coming back. And we're not going back. And we have no intention of downsizing the American dream. (Extended cheers, applause.) Never. Never a good bet. Folks, we see a future where American — where America leads not only by the power of our — the example of our power, but by the power of example, where we bring our troops home from Afghanistan just as we proudly did from Iraq — (cheers, applause) — a future — a future where we fulfill the only truly sacred obligation we have as a nation. The only truly sacred obligation we have is to prepare those who we send to war and care for them when they come home from war.